Andy Goldfine, the Johnny Appleseed of motorcycling, was looking for a better way when he invented the first Roadcrafter suit circa 1985. Before the Roadcrafter, it was pretty much your choice of leather, waxed cotton or some combination of snowmobile and Alaskan fishing gear if you wanted to stay reasonably warm, semi-dry and somewhat safe on your motorcycle. Thirty years ago, too, business dress codes were more conservative than today – which pretty much meant dressing for success precluded commuting by motorcycle. “I wanted an all-in-one piece of protective and comfort riding equipment so I could motorcycle more days and to more kinds of different destinations in my everyday life. And do it easier and faster – with less time in a car,” says Goldfine. The Roadcrafter was not an overnight success, but craftily getting the things on the bodies of magazine editors was the best kind of advertising, for the simple reason that the Roadcrafter was the handiest, most versatile piece of full-body motorcycle wear ever devised. Thanks to its genius ingress/egress system – step in and zip the right-leg zipper from crotch to ankle, then zip the main zipper from neck to left ankle, done! – the wearer could be in and out of the suit in about 10 seconds instead of 10 minutes with whatever sort of suit underneath was required – from birthday to business. Once inside, the suit offered an excellent level of protection from abrasion and impact, thanks to its multi-layer cordura construction and closed-cell memory foam armor. Plus, thanks to its Gore-tex lining, the thing was 90-percent waterproof as well. The only winged insect in the unguent was that if you rode in heavy rain for more than about a half hour, water would find its way past the main zipper and leak stealthily into your crotch, putting a literal damper on your moto-happiness. 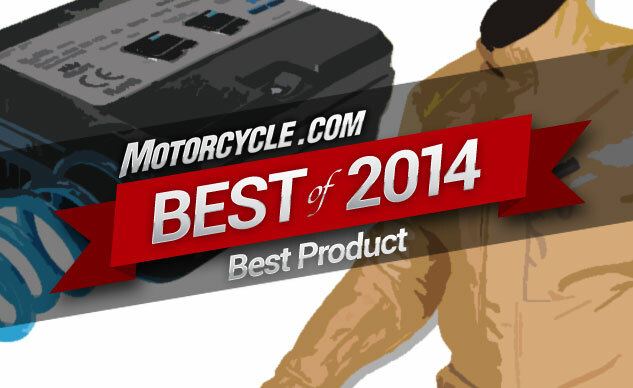 Welcome to Roadcrafter 3, MO’s Product of the Year for 2014. Among the upgrades to R-3 are waterproof zippers that eliminate the old suit’s annoying incontinence. Another new feature is elimination of the suit’s inner lining, making it lighter and able to vent more air when riding in hot weather, thus expanding the trusty old Roadcrafter’s performance envelope at both ends. Aerostich makes the R-3 in 31 different sizes (also Tall, Medium, and Short) by hand in Duluth, Minnesota, where somebody’s always there to answer the phone. 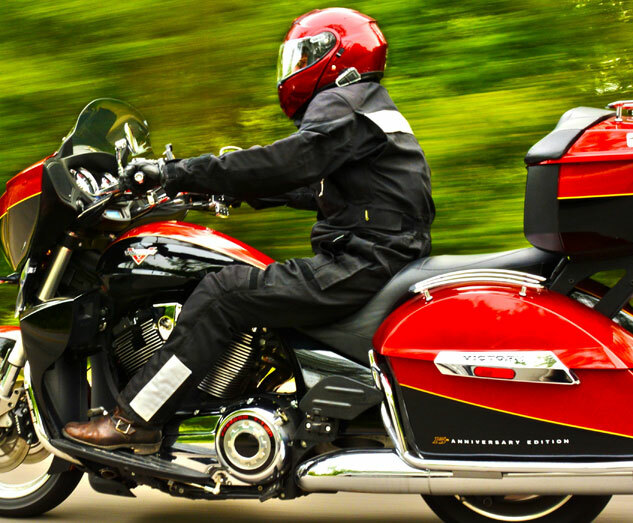 At a retail price of $1,067, the Roadcrafter 3 isn’t cheap, but the best stuff never is. We don’t stumble across products that perform a simple-but-necessary task that manages to stop us in our tracks very often. However, when the new Mini Pro Inflator from MotoPumps arrived just this week, we were stunned at the thought that went into this 12-volt air pump. Essentially, MotoPumps has released a product in an already well-established market, yet defined its offering through convenience, size and motorsports-focused portability. While the 2″ x 4.75″ x 5.75″ form factor is too large to fit under most motorcycles’ seats, it will easily accommodate itself to hard or soft bags. In that neat, little package comes an LED light, an LED backlit gauge, a total of 10 feet of cable to reach your power source, and a pump capable of producing 50 psi – all weighing in at only 18 oz. Since it draws less than 5 amps, it is also CAN BUS compatible for BMW riders. A variety of connection options are available. When tested on a flat 190/50-17 rear tire, the Mini Pro inflated it from 0 psi to 36 psi in 7.5 minutes when powered from the bike’s battery. 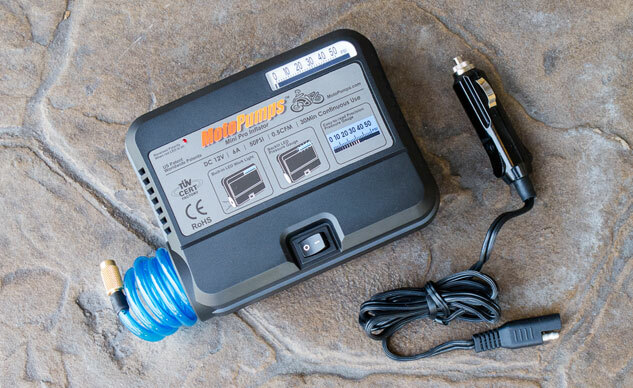 The Mini Pro is available directly from MotoPumps as a pump only for $69.99. Spending an extra $10 for the Deluxe Kit includes a heavy-duty neoprene case, battery clips and battery terminal rings. Look for a full review of the Deluxe Kit soon, but know that we’re already very impressed with the quality of its design and execution.